How long does a fully charged card last? Depending on usage, you can expect a fully charged card to last approximately 4 to 5 months. How long does it take to charge the card? The card takes approximately 1 hour to charge. When the card is fully charged the blue light will go off. With some models of the Recharge card, we have added a green light to show that the card is fully charged. If you see the blue light on and a green light showing, this means that the card is fully charged. How do I know if my card needs recharging? Safedome will send you an alert when the battery is getting low. You will receive a second alert about a month later if you can’t recharge your card straight away. How do I recharge my card? Position the card on the charger as shown in the diagram below. The card will start charging when the blue light comes on. When the card is fully charged the blue light will go off. The card takes approximately 1 hour to charge. Why isn’t the blue charge light coming on? Check the charger is plugged into a USB port that is active. The card is already fully charged. The card isn’t placed on the charger correctly. Try repositioning the card, see the diagram above. The card does not appear to be charging. Sometimes the Charger can hang, so if your card is not charging, please unplug the charger and the plug it back in, before trying to charge the Card again. If you still experience trouble, then please drop us a line to hello@safedome.com to tell us about your problem. In later models of the Safedome Recharge, we have added a green light that switches on when the card is fully charged. When you see the blue and green light displaying, this means the card is fully charged and can be removed from the charger. If your charger is larger and shows a positional guide for placing the card on the charger when charging, then you have our 2nd generation of the wireless charger. How do I know which card I have? The Safedome Recharge card comes with a wireless charger (the Classic card does not have rechargeable batteries). Can the card beep louder? Fitting our technology into a thin card makes it tricky to produce a loud sound. We have been working hard to increase the volume and are planning a new release soon to make the sound more noticeable. Our engineers are always looking at new ways to increase the volume on the card. Check our website regularly to see our latest product enhancements. Does the charger work to charge other items? Our charger is compatible with the latest release of the Qi wireless standard (1.2.3). This is a globally recognised standard for wireless charging and means you can charge anything compatible with the standard such as phones, watches and headphones. Yes. As long as the Charger is Qi compatible with the same version of the standard (Qi 1.2.3) you can charge your Safedome Recharge card on that charger. How long will the Safedome Classic card last? We have designed the Safedome Classic card to last approximately 12 months (based on standard usage). Is the Safedome Classic Card rechargeable? No. Safedome Classic is the world’s thinnest card at just 0.76 mm thin, so there is not enough space inside to fit a recharge coil. Our other card, Safedome Recharge, is slightly thicker which can accommodate the recharge coil. Switch Bluetooth OFF for 10 seconds (via your phone's settings) and switch ON again. This will reset Bluetooth. Try connecting again. Try connecting the card again. Follow the card setup instructions and make sure the card and the phone are close to one another. If you are still having trouble, contact us at hello@safedome.com and we’ll help you out. What is the distance before the card disconnects? The Bluetooth range is dependant on a number of factors. Safedome Classic: This card uses Bluetooth 4 and has an outdoor range of approximately 50 meters (164 feet), which reduces to approximately 10-25 metres (32-82 feet) indoors due to interference from walls, other devices, large objects or even people. 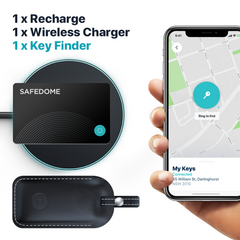 Safedome Recharge: This card uses Bluetooth 5 and has double the range at approx 100 meters (328 feet) outdoors and also performs better indoors. Why do I keep getting false alerts? 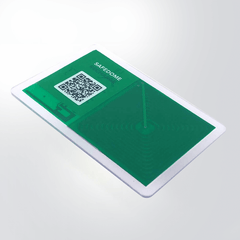 Location: Our testing shows that Safedome cards work in most wallets and purses. If you keep getting incorrect alerts, try repositioning the card in your wallet or purse. Radio interference: Occasionally buildings or certain objects can affect the Bluetooth connection and cause some false alerts. RFID: Don't use a Safedome card in an RFID blocking wallet, this will block the Bluetooth signal. If you have a metal credit card in your wallet, this may also block the signal. Flat battery: Our Safedome Classic card has an average battery life of 12 months. If you do not see a light on your card when you firmly press and hold the button, you will need to order a new card. Can I connect 1 card to 2 phones? No, but you can link up to five cards to one phone. Why can I not update the firmware. We have noticed that certain iPhones experience difficulties when updating the Firmware on the Card or Fob. If you have an iphone and do experience difficulties, please unlink the tracker from the detail screen and relink it. This should resolve this issue. You must have location services switched on in your android phone in order for Safedome to work. If it is switched off your Safedome Card or Fob will be disconnected. Why won't Safedome send me an alert when it disconnects from the app? Why can't I hear the alert? Turn on Disconnect Alerts from the Settings screen. Turn the volume up on your phone and turn off the Silent switch (iOS). How do I receive alerts, even if on silent? iPhone: Go into the app's Settings> Audio Alerts, then turn ON “Alerts on silent”. Android: Go into the app's Settings> Edit Safedome alerts, turn ON“Disconnect Alerts” and then turn ON "Ignore phone's settings". Alerts will then play regardless of the silent switch setting. Go into the app's Settings> Audio Alerts, then choose the Alert Sound you prefer. There are six to choose from. What is the smallest location (alert free zone) I can set? 30 meters (99 feet). This takes into account some inaccuracies with GPS indoors. We recommend setting Alert Free Zones to 50 metres (164 feet) or more. This will help with locations that have poor GPS. What do I do if I accidentally spill water on the card? The card is sealed and water resistant. Wipe it down with a dry cloth and check it is still working by firmly pressing the button on the card. The LED should come on. How do I turn the card off or on? Turn OFF: Go to the app's Settings and tap “Turn Safedome off”. Turn ON: Firmly press and hold down the button on the card until the light flashes. For both Safedome Classic and Recharge, the battery is sealed inside the dust and water-resistant card. Safedome Classic: The battery lasts one year or more and doesn’t need to be recharged or changed. Once expired, please dispose the card at a battery disposal centre. What happens if my card is faulty? Don't worry. Email us at hello@safedome.com and we’ll help you out. We support the iPhone 4S through to iPhone X. Your phone must be running iOS 9 onwards. We recommend the latest iOS. Early versions have had Bluetooth issues. We also support the iPad Mini and iPad 3rd generation and above, although the application is optimised for phones. We support devices supporting Bluetooth LE running Lollipop 5, through to the Oreo 8 and above. Please upgrade to the latest for the best Bluetooth and Safedome experience. iOS: Go to phones Settings > Battery and look up Safedome on your app list. For a more accurate reading, we recommend selecting "Last 7 Days" tab and checking it a week after first using Safedome. Android: Go to Settings > apps and select the Safedome app. Unlink your card from the old phone and relink it to your new one. To unlink go to the app's Settings. Will my Safedome card work overseas? Yes, Safedome works everywhere. The app needs Bluetooth turned on and an internet connection, such as WiFi or mobile data. If you don't have internet, basic alarming will still work, however, you will not see the location on a map. Can I safely take my card on a plane? Yes, Safedome uses low energy Bluetooth (LE), which most airlines allow ON when flying. If you are asked to put the card in flight mode, go to the app Settings and tap "Turn card off". Upon arrival, turn the card back on by firmly pressing and holding the button until the light flashes. Will the card work in an RFID wallet? No, RFID wallets are designed to interfere or completely block Bluetooth signals. Our cards use Bluetooth low energy. If you have a metal credit card in your wallet, this may also block the signal.